L.A.’s own pizza scene is thriving, but while we’re already home to quality deep-dish outlets like Dough Box and Masa, there’s no denying Chicago’s reign of the cheesy, over-sauced, skillet-baked pies that can only be eaten by fork or hands-on mess. So what happens when one of Chicago’s best deep-dish pizzerias heads to the West Coast? We’ll find out this spring when Gino’s East—a Chicago institution since 1966—lands on a sunny strip in Sherman Oaks. 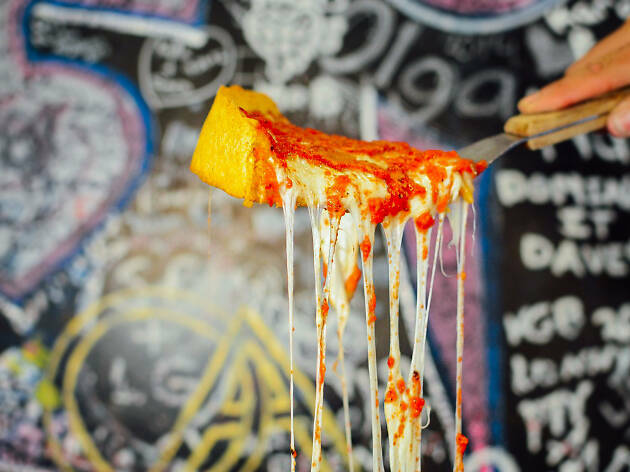 According to Eater, who broke the news, the pizza parlor will most likely open by May, a franchise outpost that’s set to use the Chicago recipes but steer clear of the signature graffiti’d walls and visitors’ names carved into the wood beams. According to the official Gino’s site this will be its first California location in decades, part of a growing enterprise that already includes hubs in Atlanta, Nashville, Arlington (Texas) and even Mexico City—in addition to eight Illinois restaurants and one each in Michigan and Wisconsin. Though it’s not the superlative take on deep-dish—a style of pie that even many Chicagoans malign—Gino’s Chicago locations attract lines of out-of-towners looking for a cheese fix. Baked in a cast-iron skillet and sporting a cornmeal crust designed to cut down on deep-dish’s trademark greasiness, Gino’s is one of the most iconic pies in the category, and all franchises offer some version of the original recipe—whether in a more classic margherita version with spinach, or in meaty flavors such as the Chicago Fire, topped with spicy sausage, fire-roasted red peppers and red onions. Given the franchise nature of some of these locations—and the great distance between them—the menus can vary, and according to Eater, L.A.’s Gino’s will offer deep dish, plus beef sandwiches, thin-crust pizzas and more. There’s no word yet on whether the Sherman Oaks franchise will offer Gino’s East’s craft beer—brewed onsite at its River North location in Chicago—but we’re keeping our fingers crossed for it. Gino’s East is expected to open at 12924 Riverside Drive in Sherman Oaks by May. I'm not sure I understand this, could you elaborate? 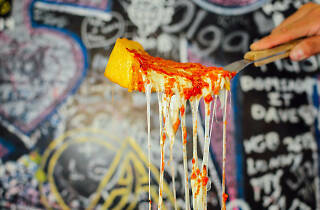 "Though it’s not the superlative take on deep-dish—a style of pie that even many Chicagoans malign..."